Imagine going on a simple day hike or afternoon hunt only to find yourself lost, injured or victim of a broken down vehicle miles from anywhere. Do you possess the skill necessary to survive for a week, a few days or even overnight? Early hunters left their camp or cabin with two goals: first, harvest the wild game necessary for their family’s survival and second, ensure they personally survived to bring that harvest home. Modern hunters take for granted the potential dangers that are possible while in the field, that is until it is too late. Where our ancestors may have perished do to massive injuries following a bear attack , massive infection from an untreated injury or some similar horrific event today’s deaths are often due to a lack of water, hypothermia or another easily avoidable aspect of being temporarily lost. In other words most of the modern losses could be avoided IF those involved possessed some simple skill, skill which were second nature to our fore fathers. There are two key issues which must be addressed to better your chances of survival – fire and water. Unless you have a serious injury which requires attention these two issues are the make it or break it of wilderness survival. Without either you can greatly reduce your chances of making it home in one piece, even if stranded for only a short time. Water – the human body is comprised primarily of water and its replenishment is vital to survival. Bottom line is without a steady supply of clean water you will die. Finding water is not as hard as many believe – every brook, stream or puddle contains water. The real issue is the purification of that water. If you have chemical tablets, purification filters or chlorine available each is an option when it comes to making your water safe to drink, but nothing works quite as well as simple fire. Quickly boiling your water is an excellent means of providing safe, health sustaining water. Fire – Aside from water fire is probably the most important aspect of survival. It provides protection from dropping temperatures, can assist is keeping predators at bay and also allows you to ensure the water you collected is safe to drink. 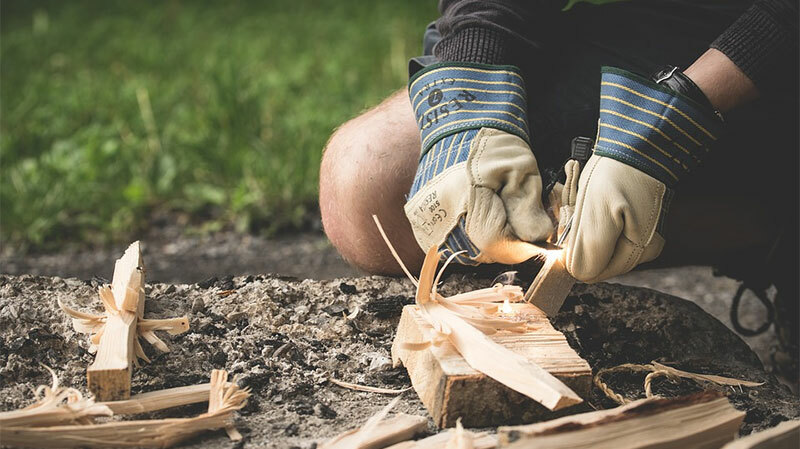 Most modern sportsmen do not carry a flint & steel , something early settlers would not have left home without, but that doesn’t mean you can be prepared with a simple lighter or waterproof matches just in case. Before you can start your fire you need to know how to collect firewood and how to build a fire which will burn. Dead limbs taken off standing trees will be dry enough to burn if after a rain or snow storm. Pine pitch and birch bark burn easily and make excellent fire starters while leaves and grasses tend to smoke more than burn. Once you have collected you fuel arrange it ins tepee with the tinder in the middle surrounded by fuel with larger pieces layered over smaller twigs and branches. Water is the true life line. Experts recommend the average person drink 1-3 gallons of water per day, more if injured or under extreme physical demands. Without water a health adult can only survive 3-5 days, if you are injured or sick this timeline decreases dramatically. For most people this is not an issues, not even something they think about as water is only as far as the sink or water cooler. But if you are stranded in the wilderness water is literally a matter of life or death and finding it is a priority. When faced with survival water is job number one. But not just any water will fit the bill. I know, you tell yourself that if faced with possible death any wet puddle or dirty stream will taste like fine wine. However, drinking dirty water can be as dangerous as drinking no water at all. Salt water can dehydrate and cause serious internal problems. Even otherwise clean appearing water can contain microorganisms, the ingestion of which can lead to debilitating illness as dangerous as thirst. The answer to real survival is finding clean water and knowing how to purify it to make sure it is also safe water. So how do you purify water when you do not have the benefit of a home filtration system? Let me show you. Heat things up – boiling is the easiest and oldest means of purifying water. Although boiling will not remove chemical contaminants such as pollutants or heavy metals it will kill most germs or parasites. Unfortunately it will not improve the taste. It is helpful if you select your water from a moving source as close to the headwaters as possible as this lessen the chances of it containing pollutants. All water should be boiled for at least a minute. If water is stored after boiling germs can reestablish so it will need to boiled again before use. Clean it – if you cannot heat it clean it – with chlorine. Liquid chlorine bleach is an excellent means of killing a wide variety of germs, pathogens and microorganisms which is why most municipal water treatment systems incorporate it as part of their process. Purifying water with chlorine is not nearly as difficult as it sounds. Simply add 2 drops of bleach per quart of water, shake and let stand for 30 minutes. If the water is cloudy or does not have a slight bleach smell when checked repeat the process. Build a stile – Do you know what the average person drank before water purification was wide spread? Alcohol. Why? Because the distilling process not only killed germs, microorganisms and pathogens it also removed heavy metals, salts and most other harmful chemicals. You can use this to your advantage for long term survival as well. To distill water simply heat it to boiling, place something above to collect the steam and then gather the steam. When the steam cools and returns to liquid form you will have as close to pure water as possible. There you have it, three ways to purify water and stay alive.